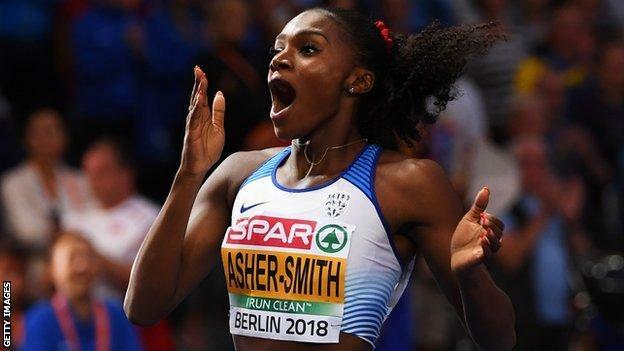 Great Britain’s Dina Asher-Smith completed a European Championships sprint double in Berlin on Saturday. The 22-year-old, who broke her own British record to win the 100m, left world champion Dafne Schippers trailing to take 200m gold in 21.89 seconds, the fastest time by a woman this year. Eight-time world champion and four-time Olympic champion Michael Johnson assesses her chances of winning Olympic gold in Tokyo in 2020. I have been watching British athletics with the BBC since 2002 and in all that time I have not seen anyone like Dina Asher-Smith. There have been athletes who have shown as much if not more potential in their junior career. British sprinting at junior level has always been good. But at this point in their career, someone who has continued to improve year after year, can compete against the best in the world and has the full package, physically, mentally and in terms of their attitude? No. I don’t think I have seen anyone like her. And I think the facts would support that. There hasn’t been anyone who has got to this point where they are a global medal contender at such a young age, other than Jessica Ennis-Hill. Mo Farah took a lifetime to realise his potential, and if you look at Greg Rutherford, nobody ever expected that either. He just happened to hit a time in the long jump when it was a bit easier to win championships. No disrespect to Greg because I have always said you win against the people who you are up against. How much faster can she go? Dina can go faster. How much faster is a difficult one. She’s obviously still very young and still learning the 100m and 200m from a race strategy point of view. I am sure she and her coach can still find some improvements from a speed and power standpoint. The other way is in terms of her competitiveness. She has shown in the last couple of years and in Berlin that she is a great competitor as a race favourite. She won’t be the race favourite – she’ll be one of the favourites – over the next two years at the World Championships and Olympics. That is a different way of competing. How fast can she go? Given the times that she has run here, any improvement at all and she is in medal contention, even gold-medal contention. I said after Dina’s victory in the 100m that she reminded me of 2008 and 2012 Olympic 100m champion Shelly-Ann Fraser-Pryce. She is similar in stature and similar in the way she dominated the 100m. The way she executed the race with a very quick start out of the blocks, separating away from the field with no real glitches in technique or transition, all reminded me of Shelly-Ann. All of the stages of the race were very smooth and with great technique. That is one of the advantages that Shelly-Ann has had and that is something that Dina has as well. Personality of an Olympic champion? We have talked a lot on BBC Sport down the years about British sprinters who appear to have had the potential to be a World Championship and Olympic medallist. In many cases they haven’t got there. More often than not that can be attributed to the decisions they have made, which are based on maturity and an ability to handle the pressure. One of the strongest things about Dina which makes me believe that she could get to the Olympic podium is her maturity and her attitude. She is a focused athlete who is enjoying the sport but who is also driven and goal-oriented. She’ll need to be. There is such a desperation in Great Britain for a champion in any event that it does create a tremendous amount of focus and pressure that athletes from other countries such as Jamaica or United States probably don’t feel. That absolute desperation is unique to Great Britain. It is what makes the sport so great here but it is also one of the things that creates a tremendous amount of pressure. I think that she is probably better at 100m than 200m, purely as an athlete. But the 100m is more competitive which makes that race more difficult. The 200m isn’t quite as competitive at global level. I don’t think there is a problem with doubling up; I think that is her future. I would actually caution against just focusing on one because you want to be a world and Olympic champion and her chances are better if she is doing both. I don’t think her chances are going to dramatically improve by focusing on one. Is she capable of winning gold in Tokyo? She is the complete package and now it is just a case of trying to eke out the little improvements in all phases of the race and just be a fraction better. Do I think people are getting carried away? You’re British. The Brits always get carried away. I don’t think that is ever going to stop so, if I were in her position and I was her coach, I would develop a strategy to make sure she doesn’t get affected by that. There’s nothing you can do as an athlete to stop that, you just have to figure out how to deal with it best. Is she capable of winning gold in Tokyo? Absolutely.